Traditional media in Philadelphia has had a rough year. The closing of City Paper and major layoffs at online, print and television news outlets herald changes in the way millennials access and consume media. To address this shifting landscape, Philadelphia Media Network (PMN), owners of Philly.com, Philadelphia Inquirer and Daily News, tapped a team of Drexel students and alumni to find new ways to engage local college students and young professionals with their content. The result of their collaboration is FollowPhilly, an iPhone app designed to aggregate local news, curated specifically for 18 to 34 year olds. The app began the beta testing process in the fall term. “We are focused on trying to understand how millennials engage with news, what are the trends, how has the industry evolved… and where is it going,” said Julia Casciato, senior English major and associate project manager. Casciato, former editor-in-chief of Drexel’s student newspaper, is pursuing a minor in marketing and leads the team with support from Jordan Motzkin and 2012 LeBow graduate and digital entrepreneur Ari Winkleman. The project began as a consulting course focused on determining the interests and needs of the target age group. From there, a smaller team took on the task of developing the technology to make the app a reality. 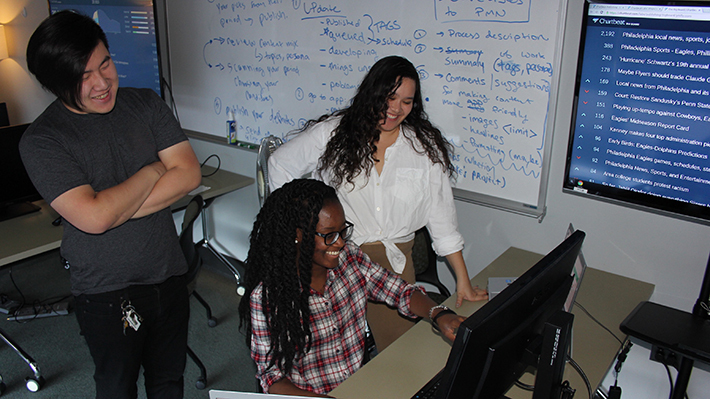 Marketing majors Zunteng Lin and Sarah Woode-Afiriyie joined Casciato and Winkleman as content curators in the fall. In this role they review the stories coming through the PMN network and decide which will appeal most to their target demographic. They then choose headlines and photos to go with each story on the app. Ultimately the team’s goal for the app is to connect young Philadelphians with the city around them. Stock exchange news startup Cheddar’s unconventional ways work well for Bradley Smith ‘12, who says working with an organization with such an atypical approach is exactly where he wants to be. LeBow consulting class develops The Boost as approach to combat extremism and recruitment of students by extremist groups for the U.S. State Department. The marketing course selection is for students who are interested in demographics, research, advertising, branding and related fields. The recommended plan of study includes classes in communications, society and culture and finance, in addition to fine arts, business consulting, management simulation and more.